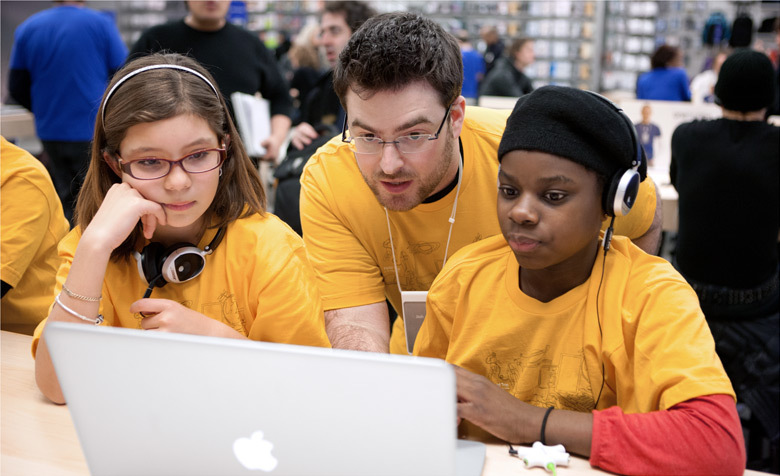 Apple’s summer workshops will be hosted between 11 AM and 12:30 PM local time, on various dates from July 20 to August 7, in the United States, Canada, China, France, Germany, Hong Kong, Italy, Japan, Netherlands, Spain, Sweden, Switzerland and the United Kingdom. Parents are recommended to sign up early since space is limited and available on a first-come, first-served basis. “Stories in Motion with iMovie” teaches kids how to create their own movies, ranging from storyboarding ideas and shooting video to creating an original soundtrack in GarageBand on an iPad and editing in iMovie on a Mac. “Interactive Storytelling with iBooks” shows kids how to create their own interactive books by drawing illustrations on an iPad and adding sound effects and Multi-Touch features using iBooks Author. Apple notes that children must be accompanied by a parent or legal guardian for the duration of each workshop.